With the decision made to emigrate to Canada in 2017 the duo, continued to play to packed theatres, shared their joy and making Canada their home. This mood tumbles into the album that is full of positivity. The sound has a relaxed yet more mature feel than their previous albums including Behind The Wheel. With an ambience of pastoral tones cleansing vibes and a celebratory feel to the whole album. The Red Dirt Skinners have captured the feeling of being at home with oneself, the feeling of being grounded finding the place that feels right for you on Under A Utopian Sky. The eight original tracks are joined by an empathetic cover of Pink Floyd’s Comfortably Numb, instrumentation is different but the essence is maintained. Opening with Hey Crawford, the opening notes are pure and expansive. The vocals combine pulling the lyrics on a journey we are about to begin on the duo’s latest album. This is about being inspired by Crawford being taken to a fountain downtown, walking passed a baseball stadium and hearing people cheer. This is a song finding happiness reflected in the every day as Sarah’s sax soars over the melodic phrasing this is an uplifting song setting the tone and vibe of the album. We all know not every day is sunny and the gentle piano refrains of Blossom and Rain joined by the sharpness of the sax under Sarah’s clever tonal manipulation conjures up the oxymoron of spring blossom and rain. Once again the vocals combine in a mantra of the rain don’t stop and as the tale begins we are taken deep into the world being created over the album. With a nod to roots music and the power of melody Lay Me Down is a gentle lullaby of contentment, the day has faded into night a celebration of love, partnerships and friendships. The words speak the story and the mix of saxophone and guitar underpins the power of reed and strings in creating music together. The album soothes the soul and hugs you with fulsome harmonies that change and grow every track has a unique dimension. This is not a random I think we will add something jazzy, country or bluesy. The changes are a reflection of the thinking behind the numbers under the skilful manipulation of tones. A celebration of finding the place is explored Here With You again about honesty that you have to sometime speak out in a partnership. No song is guitar led it is Sarah’s saxophone that is the glue that holds the sound together. It is the heart and fire of the sound played with passion, delicacy and every emotion. The longest title for a track of the year may be An Isolated Episode of Transient Global Amnesia. This instrumental captures world music with deep tones, dance rhythms and the undercurrent of deep-seated anger and frustration. Rob’s drumming is incessant and demanding as the sax plays the melodies full of richness over the top. The mood changes as the sax now is full of melodic mournfulness as we hear Sad Songs, Sarah’s vocals take the lead and we hear them reflected that we are surrounded by sad songs, people talking about the good times of yesterday. This is a snippet reflecting how we feel now in times that feel sad, darker and stormy. But this is an uplifting song as the shades of the rhythm changes to country upbeat twang and they reflect it is everyone trying to find a voice, they want to be heard. Even within Sad Songs they find positivity! The penultimate and title track is their vision of living, singing, breathing being creative Under The Utopian Skies, how we will linger and stay under them. Closing out the album the saxophone plays a beautiful solo introducing Rob’s voice celebrating finding happiness with This House and being home. This is an album that has a peaceful gentleness, never self-absorbing always uplifting. Under Utopian skies is nine tracks of delicious harmonies as Sarah and Rob combine their multi-instrumental talents to create the soundscape that evokes openness, space and honesty that is reflected in the lyrics from Hey Crawford through to This House. The duo has found their place of peace and harmony, a happy place long may they continue to create music that uplifts and rejoices the good things in life. Red Dirt Skinners have always refused to be defined or constrained by a genre. They create a sound that is full of harmonics, sonic soundscapes and the clever integration of an array of instruments were no sound dominates. They are progressive musicians that push the boundaries and defy convention. The result is an album that is expansive and timeless as the Utopian Skies this artistry has been created in. 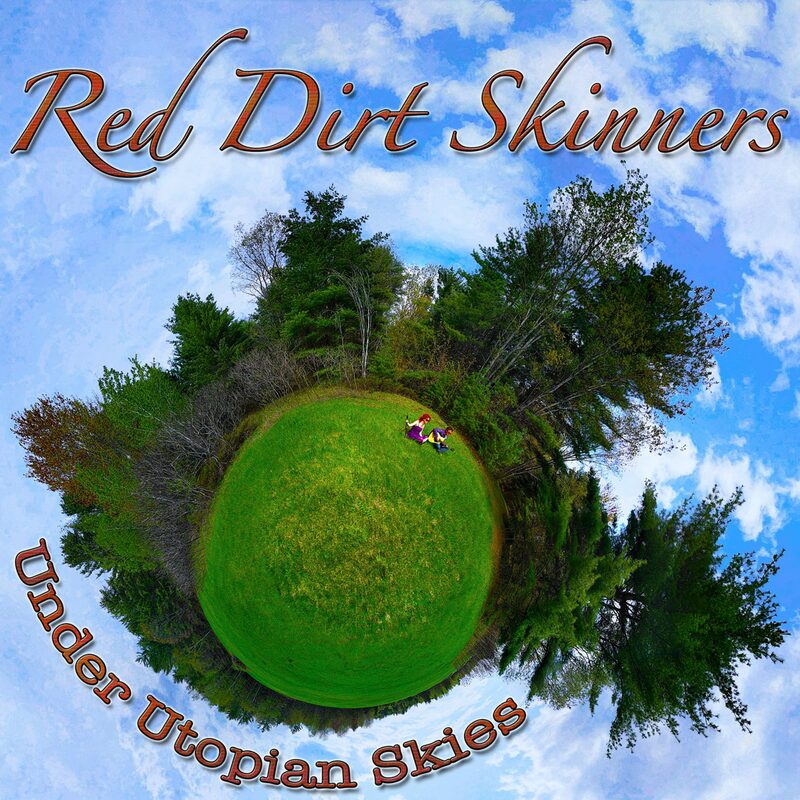 Bathe in the sound created by Red Dirt Skinners Under The Utopian skies.